Last Friday, I mentioned that I had been wanting to put up and update about Charlie and finally I’m getting around to it – woo! Our sweet Charlie joined our family on Oct. 31, 2016 and since his Halloween arrival, time has seriously gone at warp speed! He was born and then all of the sudden it was the holidays, which always seem to fly by way too fast anyway. 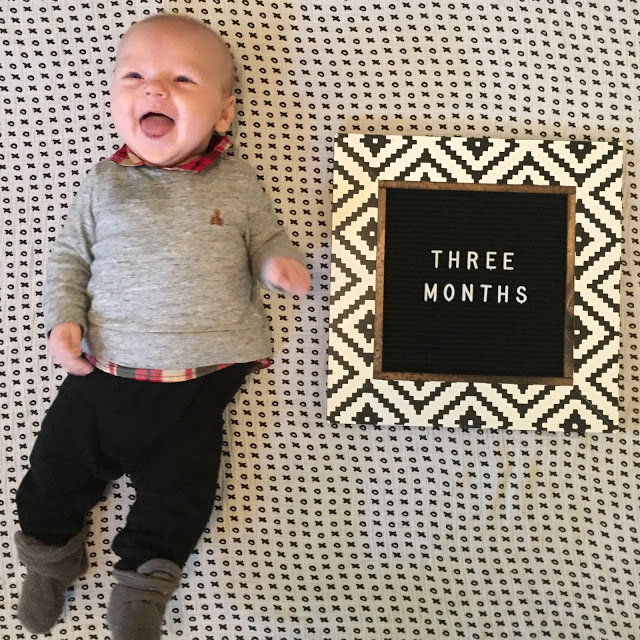 Then it was the new year and now we’re into February and I just can’t believe that he’s already over three months old. I have a sneaking suspicion that time isn’t going to slow down anytime soon, so I do want to try my best to document things for Charlie. However, I know I’m not going to be able to manage monthly updates like I did for Henry’s first year this time around. 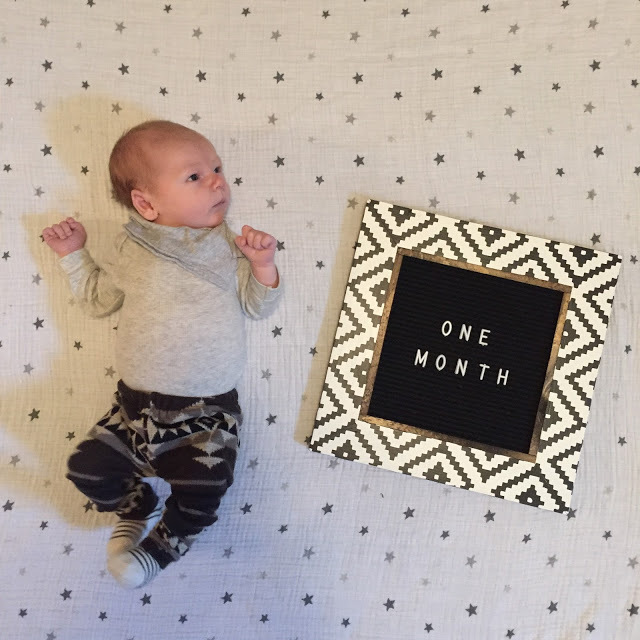 So instead, I’m going stick to taking photos each month, but I’m going to try to do a little update here on the blog once every three months 🙂 So without further adieu, here’s what life has been like with Charlie so far! The cute Aztec print letterboard is from Vermillion Drive, based here in Portland! Charlie was a big when he was born (10lbs 9oz/22 in long) and he’s been growing like a weed ever since! 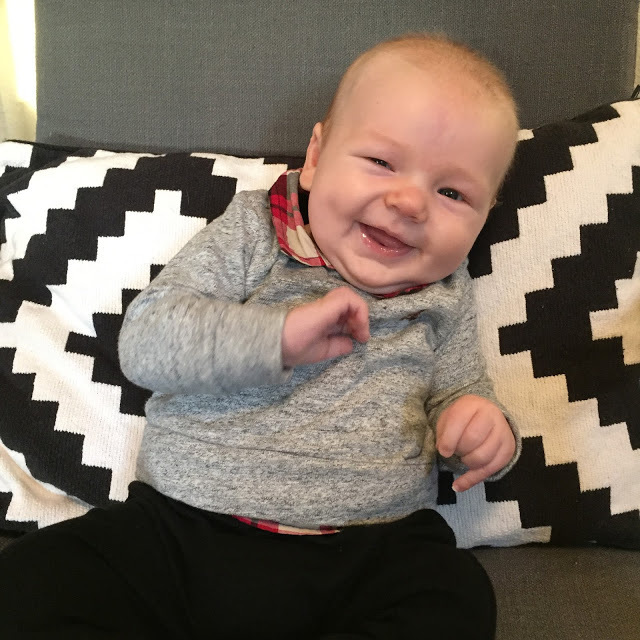 At his two month appointment (on 12/30) he was 13lbs 5oz (76th percentile) and 25in long (99th percentile). 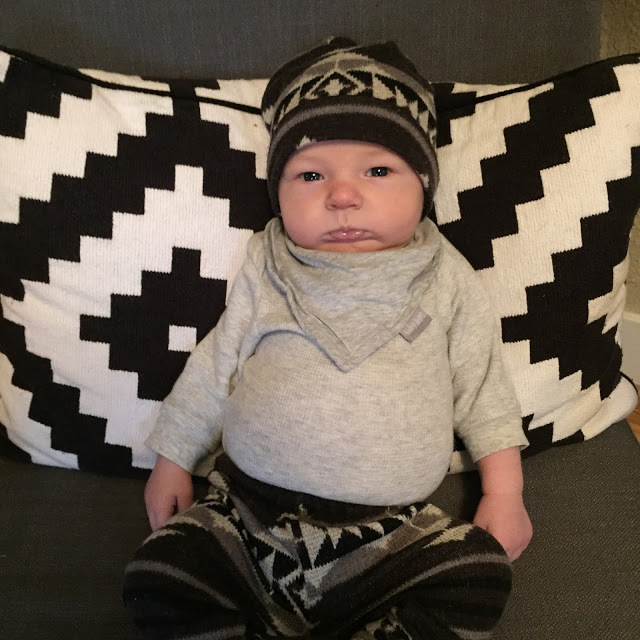 (He was also 99th percentile for head circumference!) He is just such a long baby and he feels heavier every time I pick him up, so I’ll be interested to see how much he’s grown when he goes in for his 4 month appointment next month. As for his eyes, they are blue and seem to be more blue than Henry’s ever were so I’m feeling more confident that they’re going to stay that way…but who knows! His hair is more of a mystery because he didn’t have much when he was born, except for some darker, almost wavy, hair in the back. Now, his hair in the back has a big bald spot (just like Henry did) from where he sleeps, but there are a ton of little short hairs starting to grow in on top. So depending on the lighting, he either still looks bald or he looks like he has a buzz cut with all these new little hairs popping up. And it’s hard to tell what color the hair that’s coming in is going to be because some of it looks blonde, but then in other lighting it looks more brown or even reddish. So time will tell what this little man is going to look like! Overall, he’s been pretty healthy guy! Thankfully, didn’t end up getting whatever high-fever causing virus Henry had on Thanksgiving this year. But he’s definitely been somewhat congested on and off and it’s been hard to tell if it’s just normal baby post-birth congestion or if he has had some small colds here and there. His congestion has seemed to be getting better over the past month, but last week he came down with his first real cold. Henry was pretty healthy through most of December/January, but two weeks ago he woke up with a yucky green mucus situation that’s been lingered for quite awhile and it seems like Charlie ended up getting it. The congestion has made it hard for him to nurse/sleep well, but thankfully he seems to be getting over it! 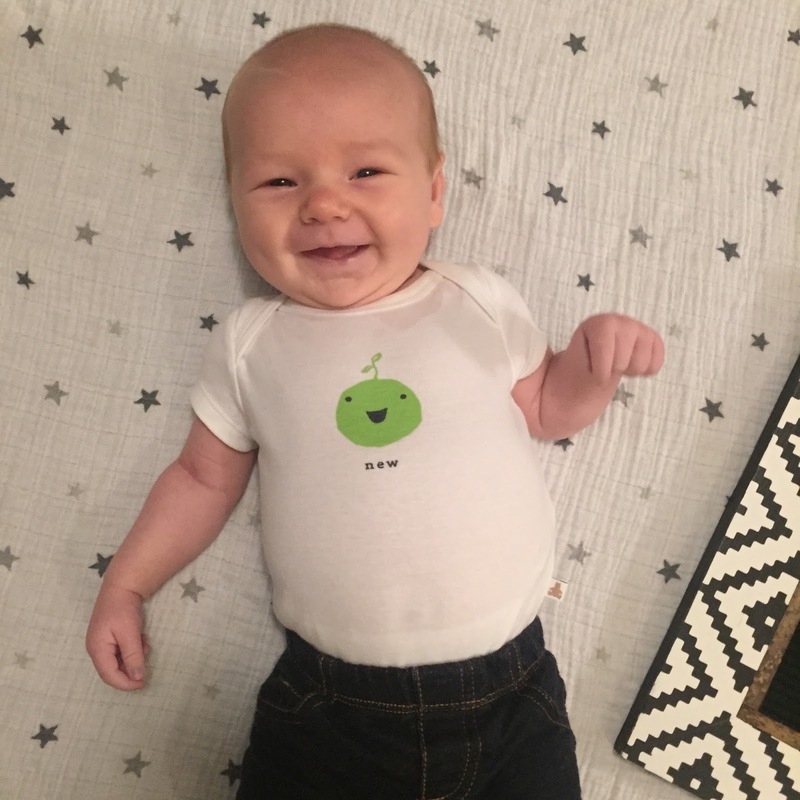 As for other health things, Charlie definitely spits up more than Henry did (from what I remember) and there have been a few times, especially early on, where he would spit up a pretty large amount of volume. 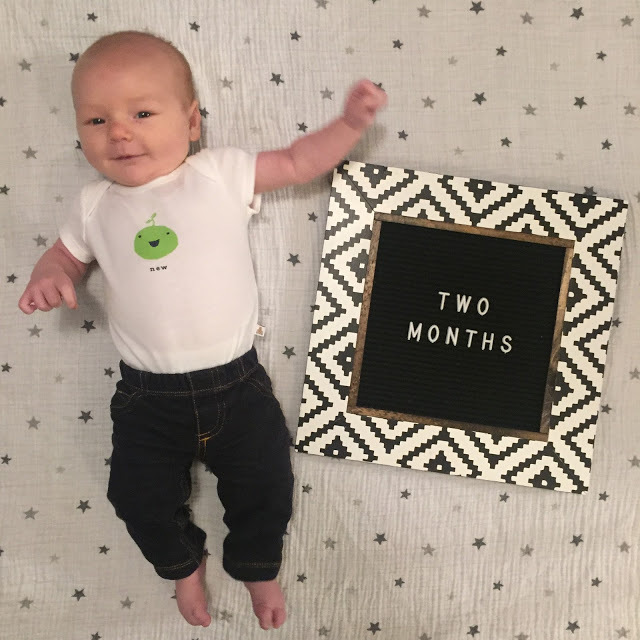 Overall, he seems to be spitting up less and less now, but it still catches me by surprise sometimes! He did have a little mild baby acne at around a month, but that’s since cleared up. However, he does have pretty fair, sensitive skin and he has some redness on his forehead that will flare up from time to time. He’s also kind of a gassy little guy and he has continued to surprise us with just how loud he can toot! (Gross but true, ha!) Finally, he did have a tongue and lip tie like Henry did, but this time we were much more proactive about dealing with it and we were able to get it fixed when he was less than two weeks old. Everything seems to have healed well and I’m so thankful that’s out of the way now! 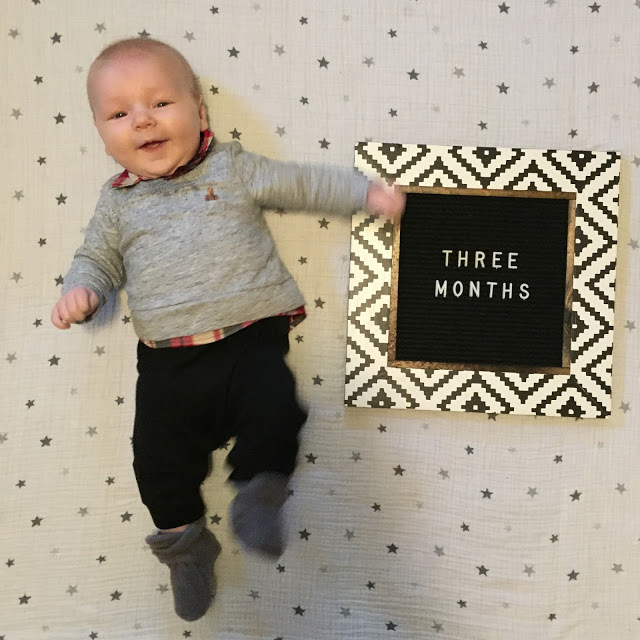 Now that he’s three months old, he’s become so much more alert and interactive. He really likes looking at our faces and making eye contact and I love getting glimpses of his personality. 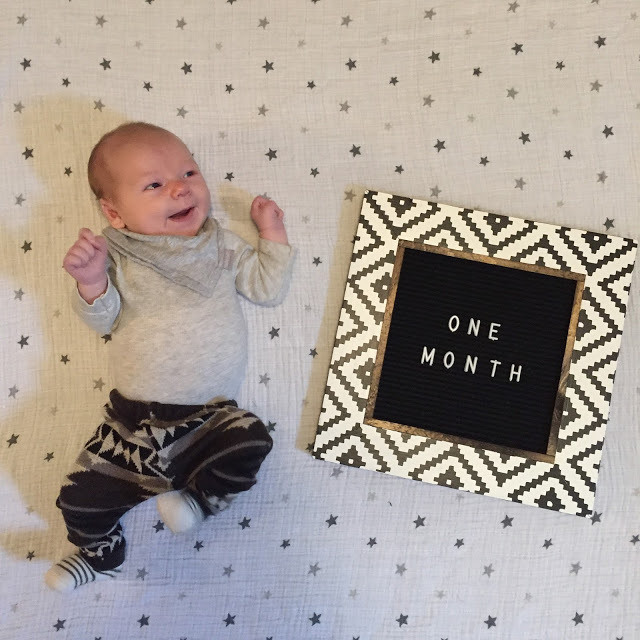 He wasn’t really smiling around one month, but as he got closer to two months, he started to smile more and more and now he’s just the happiest smiley guy. (Although sometimes he does really make you work for it!) And not to brag, but he seems to save the biggest smiles for me and is kind of a mama’s boy. (It could be that I’m his food source, but I’m sure that’s just coincidence…ha!) He likes being tickled under his chin and armpits and hearing him laugh is the best 🙂 He seems to like looking at his brother and I know their relationship is only going to continue to grow. He likes “talking” and kicking his legs and he seems to enjoy bath time. As long as he’s not hungry, he likes being in the Solly Baby wrap and that’s where he spent a lot of time when we were out and about over the holidays. He seems to love laying on the changing table we have set up on our pack and play and he also seems happier once I take his clothes off and he’s just in a diaper. He (thankfully) enjoys the swing and the car seat and will still fall asleep in either one. He also seems to like being swaddled much more than Henry did. He also seems to like tummy time a lot more than Henry did so I’ve really been trying to make sure we do it at least once a day. He seems to have great head and neck control and he loves looking around at everything! Overall though, he just has such a chill personality so far and seems happy to just be along for the ride most days! He definitely does not like being hungry or having a wet diaper, so pretty standard baby dislikes 🙂 He also seems to run pretty hot and doesn’t like when he has on too many layers! 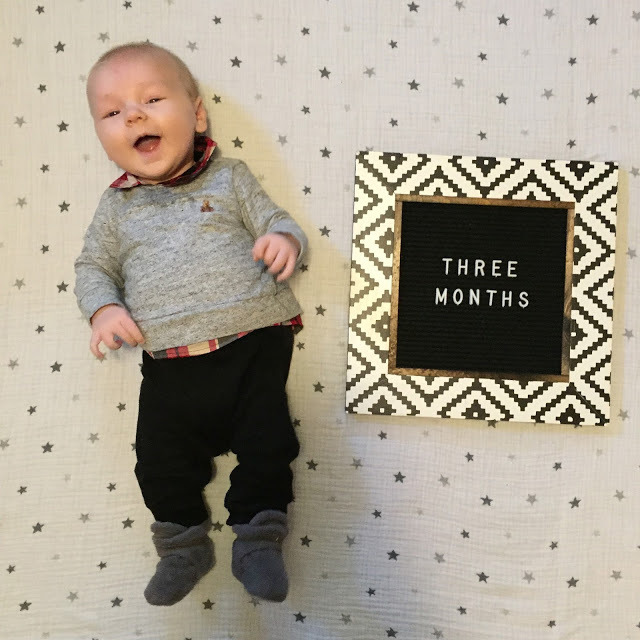 He wore newborn clothes for like two seconds when he was born, but then switched into 3 month stuff from pretty early on. But now, pretty much all that stuff is too small so I have him mainly in 3-6 month/6 month stuff at the moment. But I know he won’t be fitting in that size for much longer either, so I’m trying to get him in as many outfits as possible before I have to bring up the next batch of clothes from the basement. I saved most of Henry’s clothes so Charlie is pretty set and since he is growing so fast, it’s nice to have things ready to go when he does switch sizes, plus it’s nice to see some of my favorite little outfits once again. 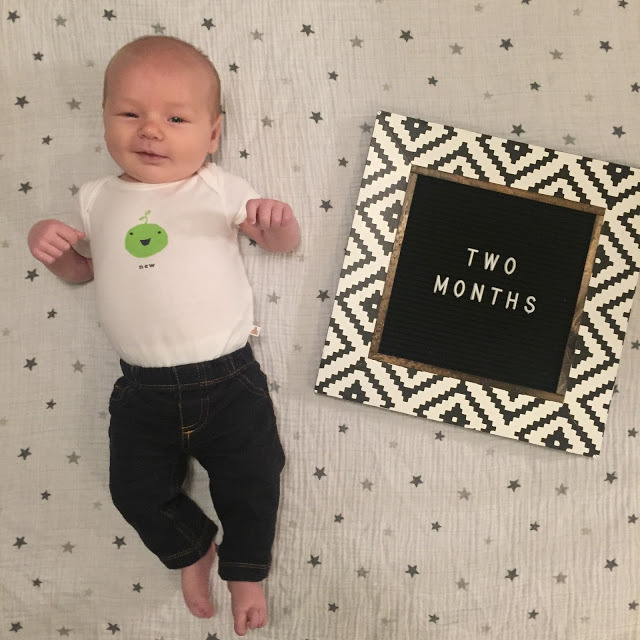 As for diapers, he started wearing size 1’s in the hospital and was wearing those up until our trip to Michigan last month and then we switched him to 2’s. But I actually just bought a pack of 3’s the other day because I think by the time we use up the size 2 diapers we have on hand he’ll be ready for that next size! Thankfully nursing is going well and Charlie is still exclusively breastfed at this point. I have hardly pumped at all since it seems hard to find the time, but I’m hoping to do that more regularly so I can build a backup stash for emergencies. He did fine the first couple of times he had a pumped bottle a handful of times, but last time we tried he wasn’t a huge fan so hopefully we can get him to keep taking it for those times when I do need to be away from him. But since I’m home, it’s just been so much easier for me to nurse him so that’s what I’ve been doing. 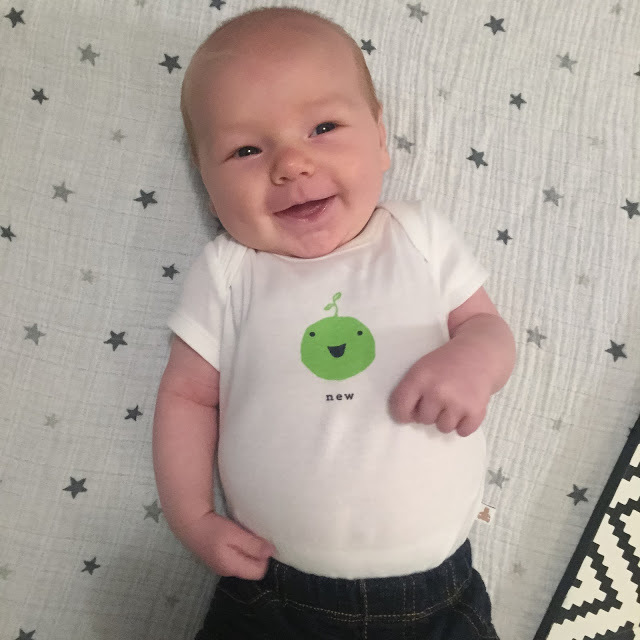 At first, he seemed like he wanted to do a lot of short but very frequent nursing sessions, but now he’s transitioned to doing much longer (as in 45 minutes+) but less frequent nursing sessions during the day and can usually go 4+ hours between feedings now. At night though, I’ll sometimes nurse him while I’m laying down and then he’ll tend to want to “snack” throughout the night/early morning. So I need to work on waking up to give him a full feeding in the middle of the night so that he’s not wanting to graze instead of sleep! The million dollar question! Everyone always asks ‘how your baby is sleeping? ?’ and with Henry, I felt like I was so much more fixated on it. This time around? I’m a lot less concerned about sleep because I know things will work themselves out eventually and I just feel like in general, the sleep deprivation is so much easier to handle because I know that it won’t last forever. We have Charlie sleeping in our room in the Bassinest next to our bed. Thankfully, he’s been ok sleeping in there (swaddled and flat on his back) from the beginning and so I’d usually put him in there when we went to bed, but over the course of the night, he’d end up in our bed. 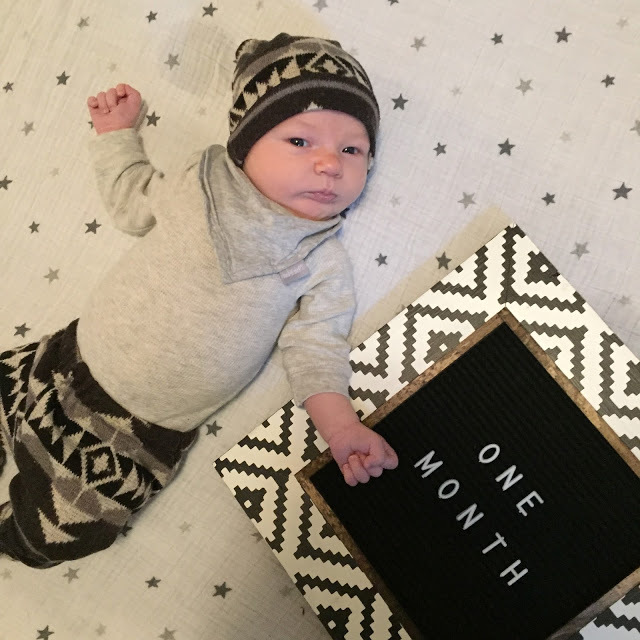 For the first two months or so, he wasn’t on any real schedule and I wasn’t even really keeping track of how often he was waking in the night because I can literally nurse him in my sleep. He’d usually take a couple naps a day, either in the wrap or the swing or his car seat and then just nurse on and off throughout the night. When we went to Michigan last month, that’s when I started making a point to actually put him down for naps. I’d feed him and then after he had been awake for about 1.5-2 hours, he’d seem ready to go down and so I was just trying to follow his cues to get him on a loose eat/play/sleep schedule. Now, we have kind of a relaxed schedule that’s helpful because it allows me to predict when he’s going to need to eat again. He typically wakes up around 8am (or I wake him because we need to leave to go somewhere) but he’s usually ok with not being fed right when he gets up in the morning, which is good because we’re often heading out the door for an activity or play date so I’ll just nurse him once I get there, around 9:30 or 10am. Then he’s usually up until around 11:30am or noon and then he’ll nap for a couple of hours. This nap will usually be in his car seat and I can usually get home from wherever we’ve gone in the morning and get Henry lunch and down for his nap before Charlie wakes up and needs to eat again, typically around 2pm. Then he’ll usually be up until around 4pm, then go down for another two-ish hour nap, and this one is usually in his bassinet. (And a lot of times Henry will still be napping at this point so I have a little window of time with them both napping!) Then when he wakes up, I’ll feed him (usually around 6-6:30pm) before we have dinner and then by 8-8:30ish he seems like he’s ready to go down for the night. I’ll swaddle him and put him in his bassinet and this is around the time Henry goes to bed, so it’s nice to have them down for the night at the same time. Then Charlie will usually sleep from about 8:30-midnight and then he’ll fuss and want to eat again, and since I’m a night owl, I’ll usually just stay up until I have to feed him at midnight and then I’ll go to sleep. After midnight, he’ll sleep for a few hours and then wake up at some point and this is where things get hazy as I don’t usually look at my phone to see when he’s waking up. If I bring him in bed and nurse him side lying, then he’ll tend to snack on and off between the hours of 4-7am. I’m trying to work on more fully waking up to make sure he gets a larger feed and then putting him back in his bassinet, and although he’s done some 5-6 hour stretches of sleep at night, I think we’re still a little ways from him sleeping completely through the night. And honestly, it’s fine. I know he’ll get there eventually and the fact that he’ll take some long naps on the go during the day is super helpful so it’s not as big of a deal if he wakes up a little at night. 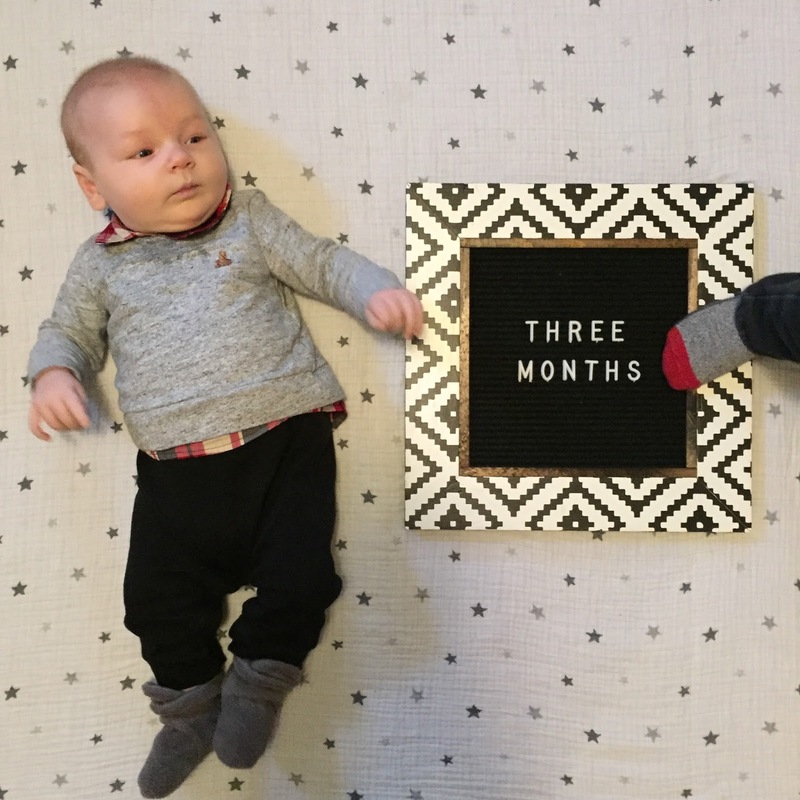 We moved Henry into his own room at around 4 months, but with Charlie, I foresee waiting a little longer but time will tell! For the most part, we’re still using and liking most of the things we used with Henry at this age, which you can see in this post. I’ve especially gotten a lot of use out of my Solly Baby wraps (I have this pattern and this pattern) and I also used the new Ergo Adapt carrier for our trip to Michigan and loved it. Charlie seems to like these Halo fleece swaddles and we use them every night and at naps when we’re home. When Henry was a baby, I’d usually just stick a blanket over this car seat but this time around I’ve gotten a ton of use out of the my car seat/nursing covers. I also got a Fawn Design diaper bag before he was born and I love it, it’s perfect for two kiddos! -Got to witness multiple snow storms and a unusually cold, snowy winter for Portland! -Rolled over from his tummy to his back at his two month doctor appointment. He hasn’t been rolling from his tummy to his back much since, but he is capable of it. And he’s sooo close to rolling from his back to his stomach. Henry wanted to “help” me taking his three month photo – LOL! Next Post New Blog, Who Dis?